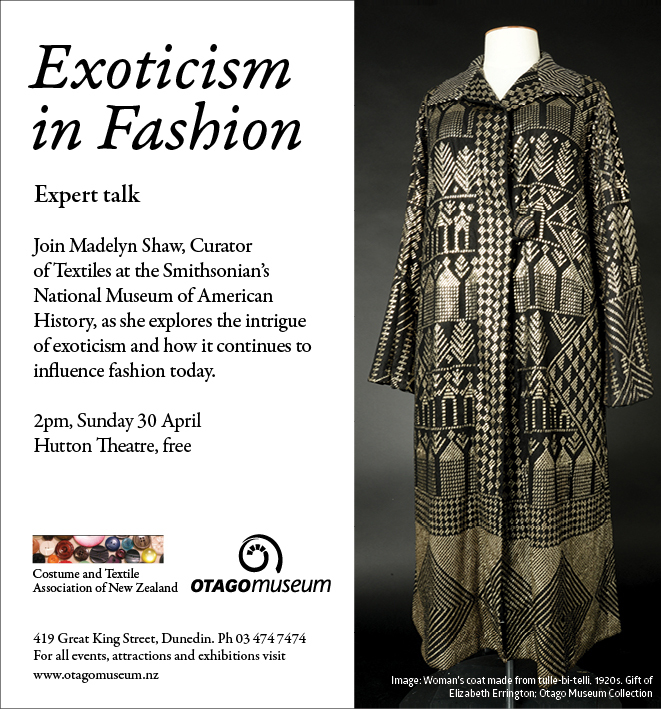 Visiting Smithsonian textiles curator Madelyn Shaw is having a busy time of her visit to New Zealand, and the Dunedin leg is no exception, with talks on Sunday at Otago Museum (Hutton Theatre, 2pm) and Monday at Otago Polytechnic. Monday’s talk on The Geometries of Cloth and Clothing explores how curves of the human body and the flatness of cloth marry together , with examples from various cultures, times and places. Otago Polytechnic, Room G106 11 am Monday 1 May. All welcome. 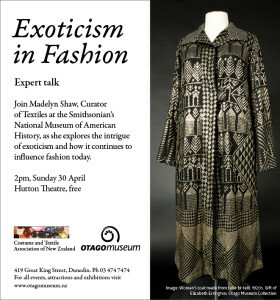 This entry was posted in Dunedin, Fashion, Lectures & Talks and tagged Madelyn Shaw, Otago Museum, Smithsonian. Bookmark the permalink.